Elephants started visiting our resort premises regularly since the start of December. It was fun to watch these jumbos grazing, chasing each other all around the open grassland next to the lake. Sometimes we also encountered them in bright afternoons near the lake. These regular visits have given us the opportunity to start understanding them better. It is important to know each herd by knowing all its individual members. We saw every time number of elephants in a herd keeps changing. Sometimes few members of the same herd are roaming around in thickets and at times its confusing either we are looking at the same herd or a different one? Like humans every elephant has special features. Body sizes, ears, tusks, texture of skin are a few basic criteria to differentiate between them. Over time we could recognize herds by looking at the characteristic individuals in herd. While observing these herds for all this season we kept tracking a pregnant elephant in a herd of nine elephants. 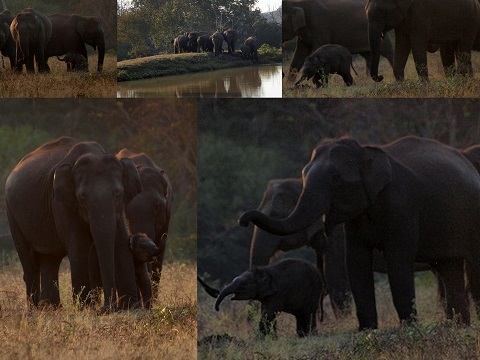 This family was really special – there were three grown up females and two baby tuskers. The pregnant female elephant was accompanied by other members of the herd all the time. Each member of her was very much protective towards her. Even young elephants played their role to give her company when old members were away. All of a sudden this herd didn’t turn up almost for a week. And then they came back with a new member in the mix! It was great pleasure to watch a baby elephant in wild. This ‘Chotu’ was all the time surrounded with elders. It hardly had his space to wander around carelessly. It was an exciting tug-o-war between protective parents and ‘born-free’ young one. It was exactly the same scene that you might see in parks and gardens between human parents and their children. Twenty minutes with this family and their ‘Chotu’ marked my mind with one and only expression, Baby’s day out! Now ‘Chotu’ is three month old and getting stronger day by day. Learning it’s lessons in the open school of wilderness only at InnTheWild, Masinagudi.